Gudrun Sjödén opened her first store on Regeringsgatan in Stockholm in 1976. The brand concept is still comfortable, colourful clothes crafted from natural fabrics and with a Nordic design. But much has happened over the years. Gudrun Sjödén has long been committed to using more sustainable and eco-friendly materials. And the customer base continues to expand. Today, the clothes are sold via the webshop and catalogues to customers in more than 70 markets, of which Germany, the UK and the USA are the fastest-growing. Over the years, Gudrun Sjödén has received many accolades as a designer and entrepreneur, including the King of Sweden’s Litteris et Artibus Medal and ELLE Sweden’s sustainability award, and has been the no. 1 Swedish fashion label export for several years. School certificate. Studies in textile design and fashion at the College of Arts, Crafts and Design in Stockholm. Employed as a designer for design houses including Ivar Wahl. Freelance designer with commissions for the ready-to-wear industry in Scandinavia, as well as fashion journalist for magazines including Femina and Damernas Värld. Starts to produce her own brand of clothing with “designed, coordinated clothes for active leisure” which are sold to stores and boutiques mainly in Scandinavia. Opens the first of her own boutiques on Regeringsgatan in Stockholm and decides to wind down sales to external boutiques. Mail order sales take off, and turnover reaches SEK 2 million. Gudrun Sjödén establishes mail order sales in Germany together with her sister, Christina Rådevik. Gudrun Sjödén runs sales via mail order and two stores in the USA. Gudrun Sjödén opens stores on Götgatan in Stockholm, and in Zirndorf, Germany. Gudrun Sjödén opens stores in Gothenburg, Sweden, and Nuremberg in Germany. Gudrun Sjödén is named Businesswoman of the Year. The home textiles collection gets under way. Mail order sales are established in Norway. 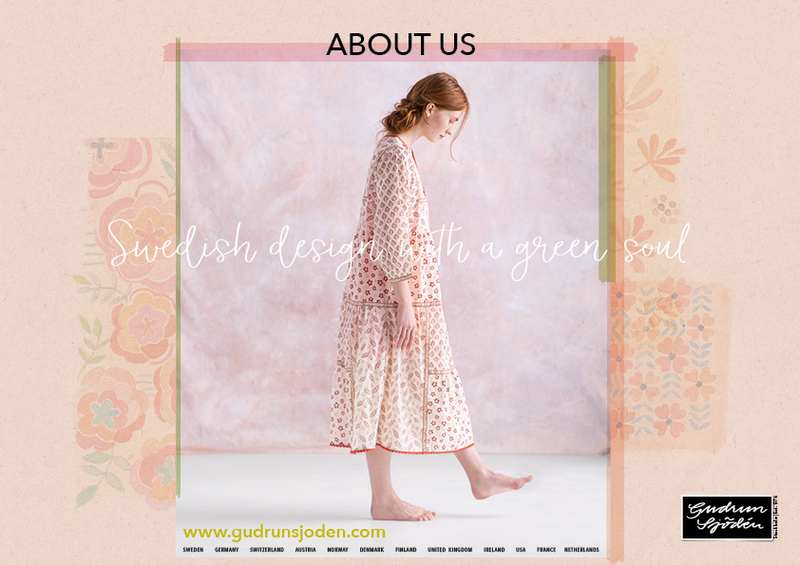 Gudrun Sjödén starts her own website in the Scandinavian markets. Mail order sales are established in the UK. Gudrun Sjödén celebrates 40 years as a designer. She opens an “experience store” on Stora Nygatan in Stockholm, selling fashion, home textiles and flowers. Gudrun Sjödén opens a store in Malmö, Sweden. She is announced “Entrepreneur of the year” in Stockholm. Gudrun Sjödén opens a store in Hamburg, Germany. Gudrun Sjödén is awarded the Stockholm Chamber of Trade “World Class Prize”. Gudrun Sjödén opens a store in Oslo, Norway. Gudrun Sjödén celebrates 30 years as a company with a big fashion show in August. Sales are started in the USA. Gudrun Sjödén opens a store in Copenhagen, Denmark. Gudrun Sjödén is presented with His Majesty the King’s medal, Litteris et Artibus in size eight, for her valuable contribution as a fashion designer. Gudrun Sjödén re-launches her greenest store in the revamped boutique at Götgatan 44 in Stockholm. Store number 11 opens in central Stuttgart in February. Gudrun Sjödén starts sales in France. Gudrun Sjödén tops the export league of Sweden’s fashion brands. Gudrun Sjödén opens a warehouse store in Årstaberg, Stockholm and a new concept store in central Berlin. The company sells all over the world and turnover reaches half a billion Swedish kronor. Gudrun Sjödén celebrates 35 years in style in September. In October, Gudrun takes part in Shanghai Fashion Week. Gudrun is awarded Elle fashion magazine’s sustainability prize in January. In March she opens a new flagship store in London. In October Gudrun wins the Businesswoman of the Year award from BPW, Business and Professional Women Sweden. Gudrun opens a new flagship store in Helsinki in February, and in New York and Cologne in March. She opens a second store in Oslo in August. and in October she is awarded the prize for “Webshop of the Year” by the Neocom gala in Düsseldorf, Germany. The book “My Portfolio” is published. Gudrun receives the American Swedish Historical Museum’s Outstanding Achievement Award and the City of Stockholm’s civic achievement medal: Sankt Eriksmedaljen. The exhibition “40 Years of Colour and Design” is shown at Stockholm Houseof Culture & City Theatre. The Copenhagen store celebrates its 10th anniversary. Exhibition at the Fashion & Textile Museum in London. New store in Freiburg, Germany. The Year. Fashion show in Stockholm and Berlin.